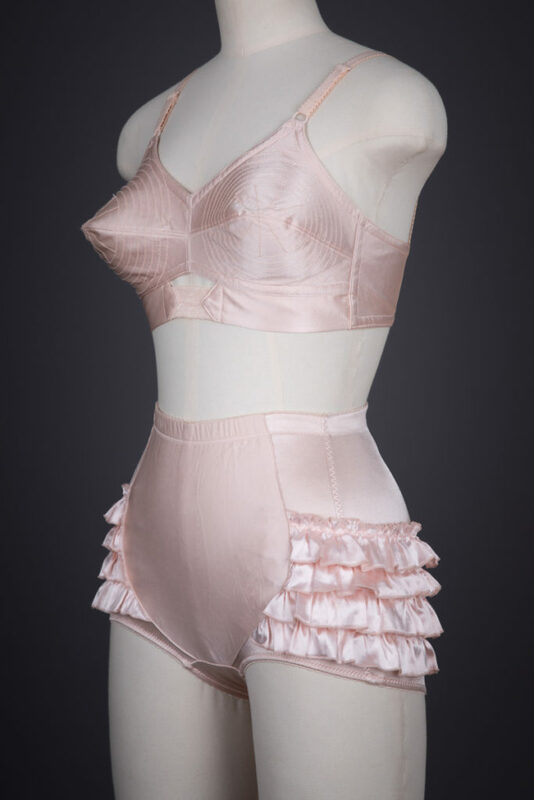 This bra and knicker set was made as part of a capsule collection designed to celebrate British heritage bra fitter and retailer Rigby & Peller. 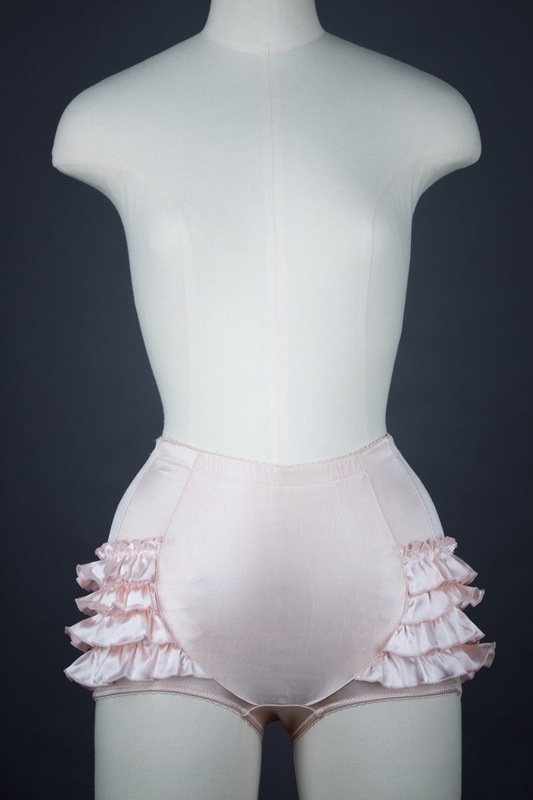 The range was called ‘Platinum’, with the designs being apparently inspired by popular 1950s silhouettes. 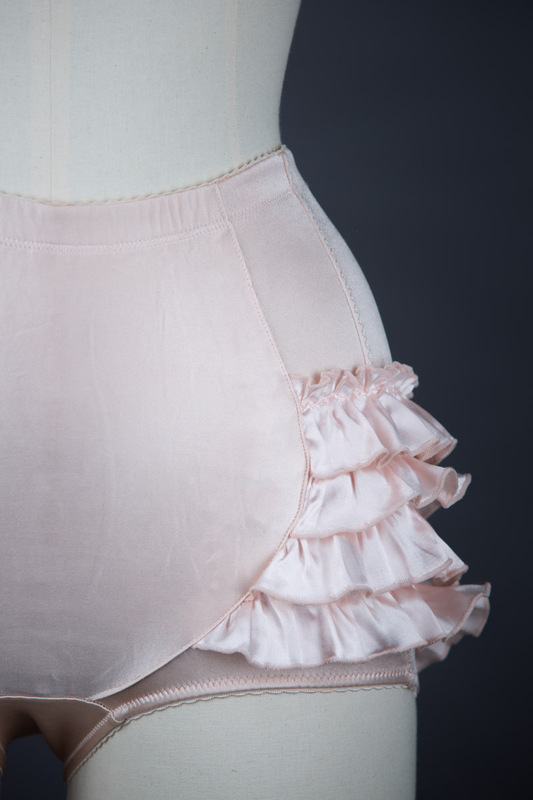 The knickers originally retailed for £89.95 and the bra for £109. 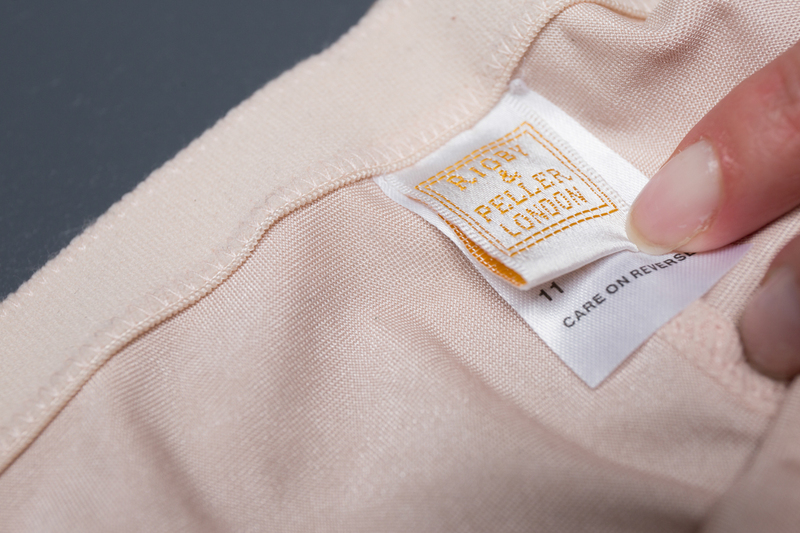 Only 150 sets were made of these designs, which were sold through Rigby & Peller’s retail stores and online shop. 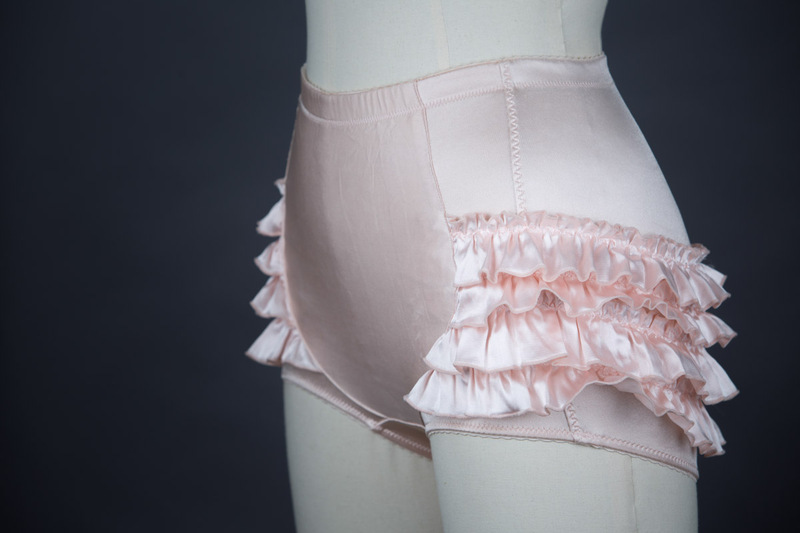 The knickers are made of a heavy-weight stretch satin, rising to the natural waist and with a low legline. 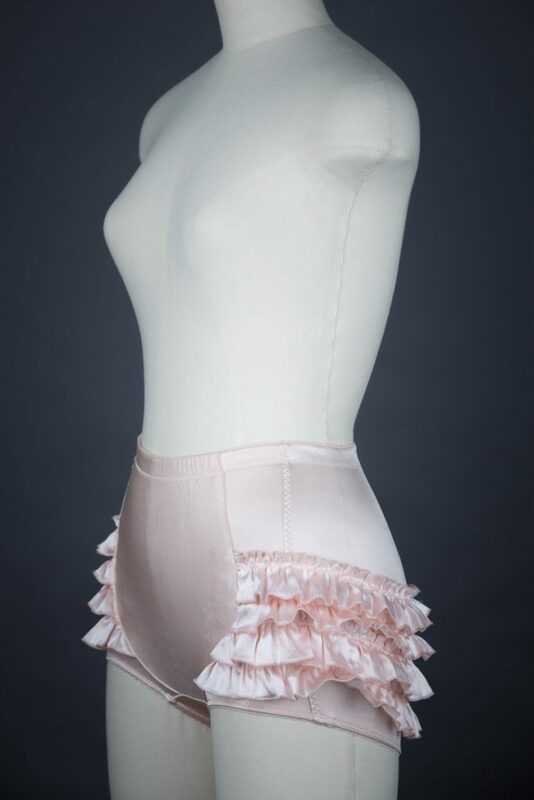 The knickers have a very sturdy construction, with heavy weight plush elastics used at the waist and legline, offering a smoothing and shaping effect. 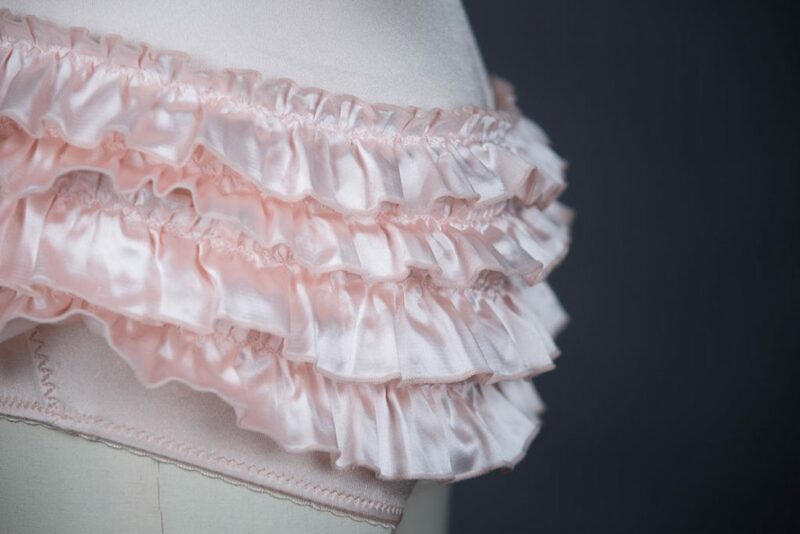 4 rows of decorative ruffles extend from the side seams across the centre back, with babylocked raw edges further emphasizing the ruffled effect. 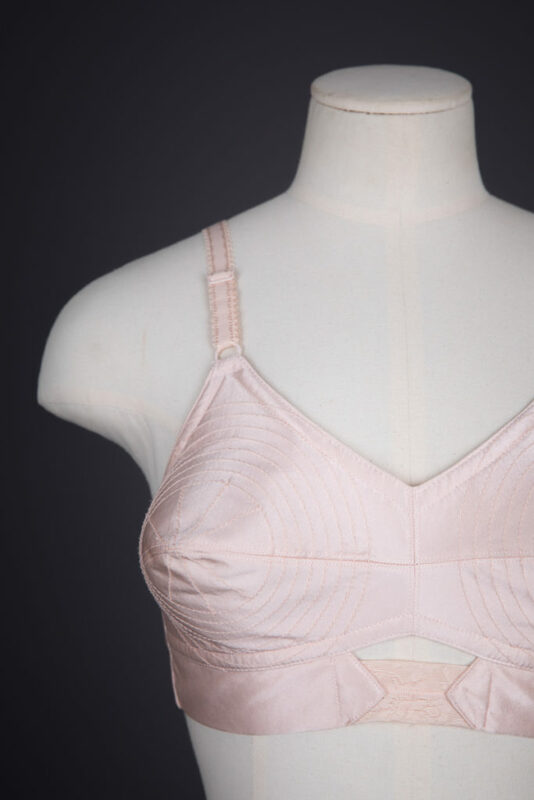 Although the bra has a silhouette reminiscent of 1950s bullet bras, it is constructed to fit a modern bust silhouette, with an interior foam padded lining. 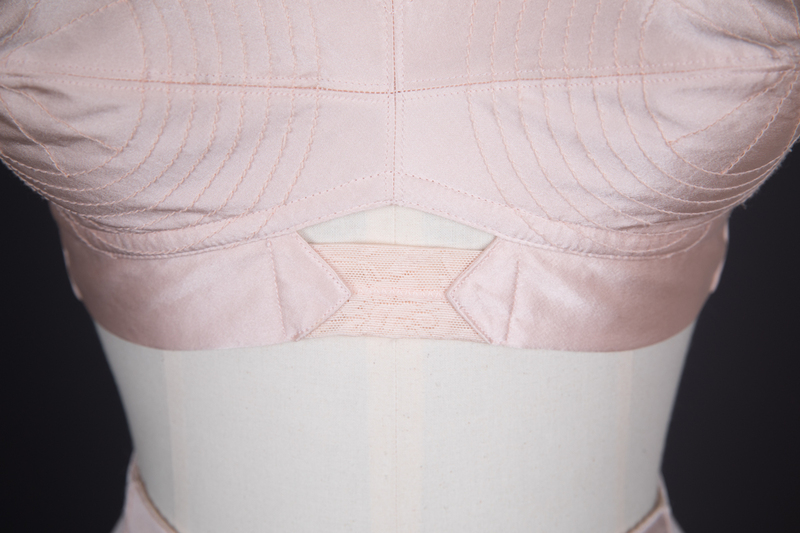 The cups are stitched with circle stitching and decorative quilting to re-enforce the pointed silhouette. 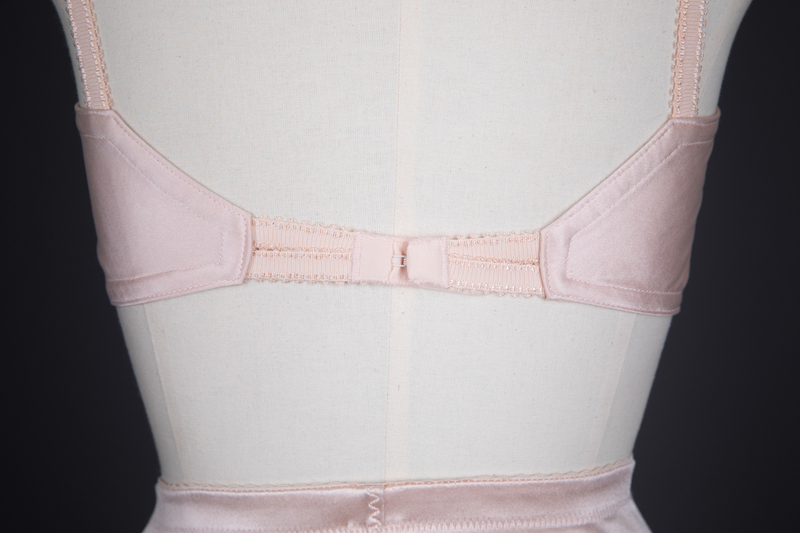 A small panel of stretch floral mesh offers some fit flexibility at the centre front of the bra, alongside small panels of elastic at the centre back. 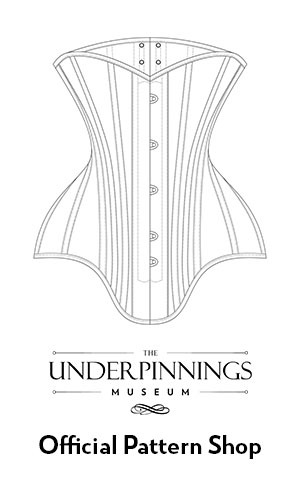 The bra fastens with a hook and eye, and the shoulder straps are elasticated and adjustable. 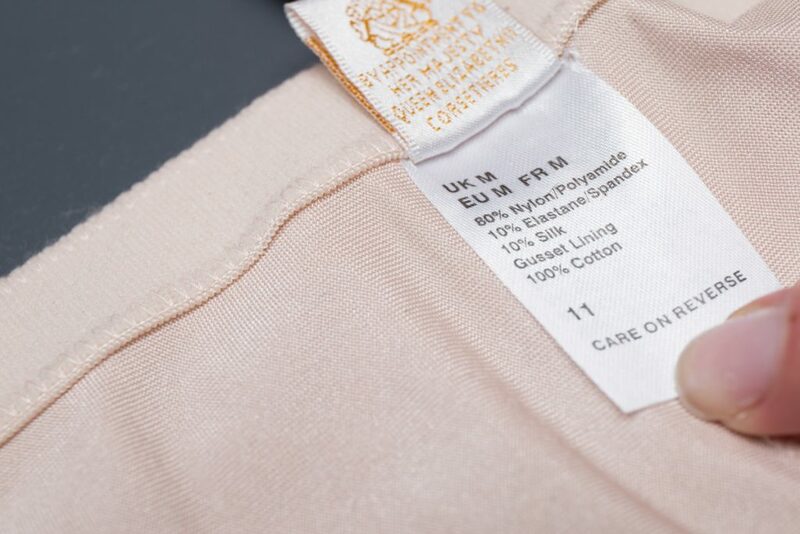 Rigby & Peller was founded in 1939 by Gita Peller (a Jewish Hungarian refugee) and Bertha Rigby (an English corsetiere), when they opened their first store in London’s West End on South Molton Street. 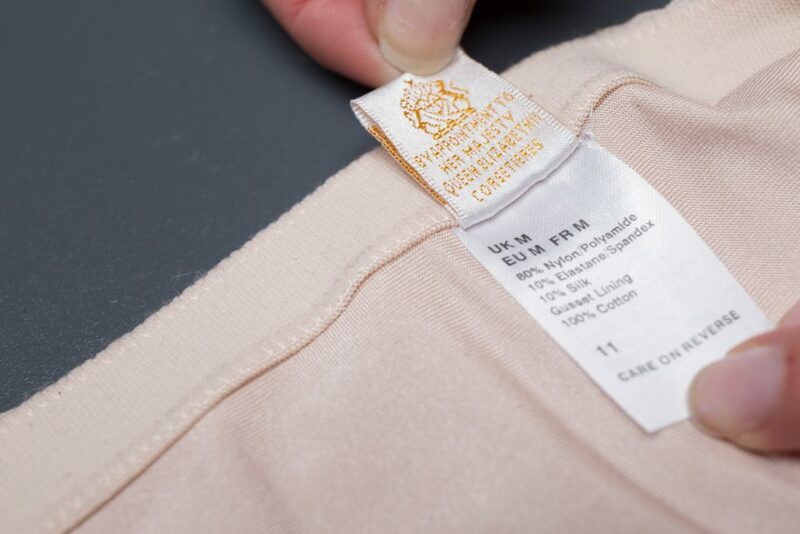 The stores held the British Royal Warrant of Appointment and provided underpinnings for the Queen and other members of the royal family between 1960-2017. 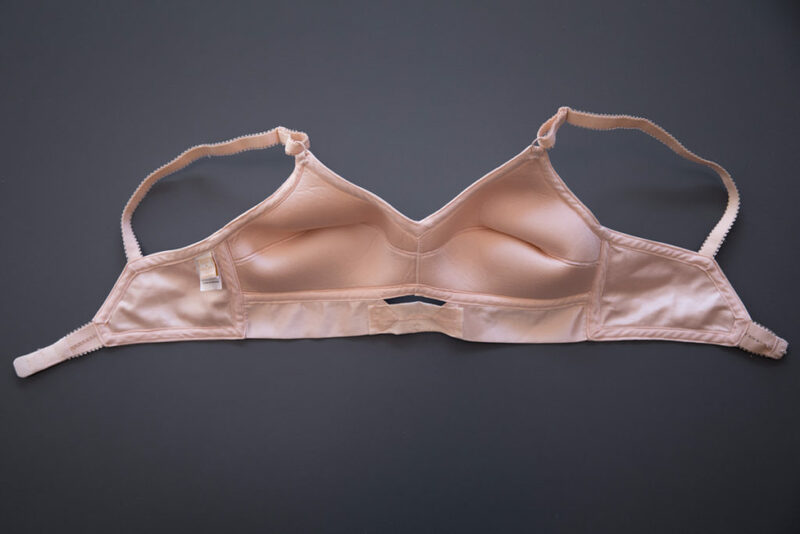 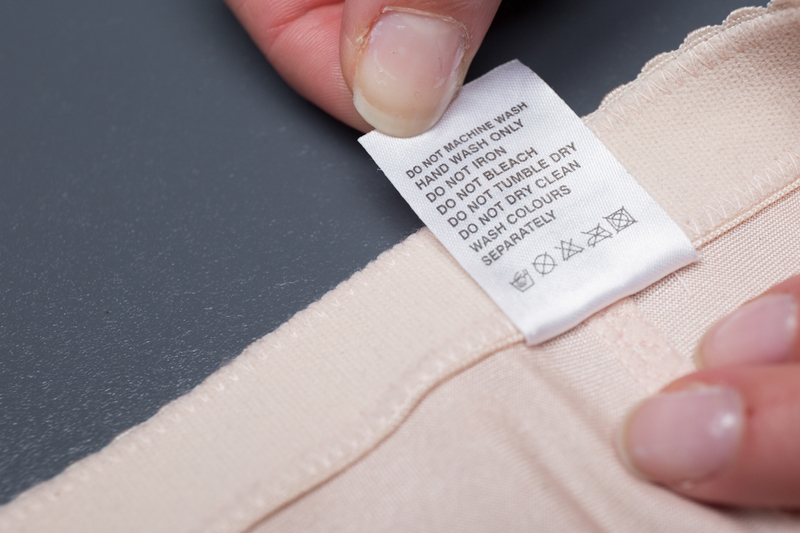 The company is renowned for its stringent approach to bra fitting.